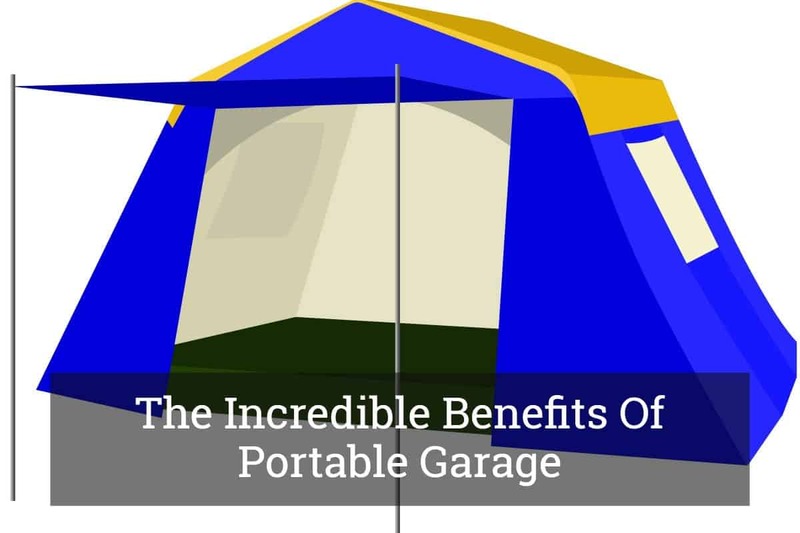 Did you know that the benefits of the portable garage are manifold? They pose as an ideal solution for those houses that have less garage room. Additionally, they can be more advantageous than permanent garages in various ways. The transferable motor vehicle shelters have gained popularity because of their features such as flexibility, portable, and easy-to-construct – amongst others. These tools are beneficial for protecting your vehicle from atmospheric elements, providing shade, and offering additional storage space. It is essential to bear in mind that you must choose durable, good-quality fabrics that can withstand harsh outdoor conditions for the covers of your transportable carports; otherwise, their purpose may be lost. Where the maintenance measures of these ports are concerned, they are only required to be brought down and given a good scrubbing. You must also make efforts to maintain your car for it to serve you well for the years to come. As part of these measures, you must ensure that you fill the air in your car tires on a regular basis. It is also important to keep the car shelters free of dirt; therefore, be sure to choose the best car garage vacuum for maintaining cleanliness of the space. Let us look at some of the benefits of these storage units. Portable garages are easy to set-up; not much effort is required for their assemblage. Additionally, they can also be taken down with ease and shifted to a different site or kept in storage, as per your requirements. Their simplicity of design is beneficial because it does not require more than one person for its installation. For building a garage, you will need labor for which you will seek the help of your friends. But the portable kits are mountable by a single person. Apart from an anchor system, there is no need for additional tasks such as drilling or digging. 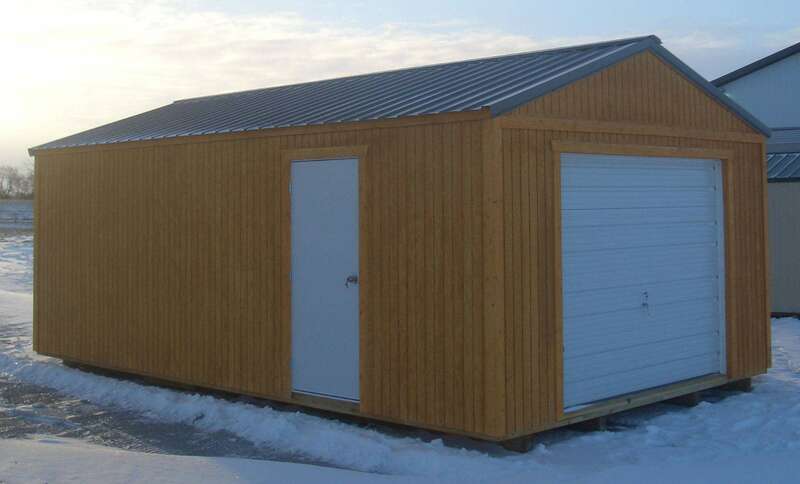 Mounting a portable vehicle shelter is cheaper as compared to building a permanent garage with other materials. Of course, the prices for transferable shelters catering to small, medium, and large vehicles are bound to vary. Also, there are cost differences in the materials and divergent options of these units. Overall, they provide value for your money and can lead to higher savings. You can consider using these shelters for safeguarding your vehicle without incurring expenses for a garage extension. It may also so happen that due to your family’s growing needs, there may need to convert the garage into a living space, in such circumstances it may be wise to opt for the portable carports for storing your car. Portability is a primary advantage associated with these types of shelters. They can be shifted to various locations on the premises and carried along when you are changing houses. During winter, they can be positioned in the backyard; in the summertime, you can park them in front of your house for gaining better access to your home. An additional advantage of these portable units is that they do not require permanent foundations. Almost any surface is suitable for their installation. Nevertheless, an even surface is recommended for stability purposes. However, you must ensure that they have a robust anchorage structure – they do not require digging or drilling. It would be advisable to procure anchor kits; various types are available, and your choice should be dependent on whether they have to be built upon gravel, dirt, asphalt, or concrete. Temporary anchors are provided, but permanent anchors are also purchasable. In line with your penchants, you can exercise your choice. Another benefit linked to transportable car shelters lies in the fact that you do not need to obtain permits. This is because foundations are not required, and a permanent building is not attached. This is good news because applying for a permit can be time-consuming; also, it adds to your expenditure. Moveable shelters are helpful in avoiding these problems; moreover, they result in saving time and money. However, as a precautionary measure, you must inquire about the permit requirements with the local bodies. The portable car storages take lesser time for their installation when compared to other automobile shelters. The set-up of permanent anchors could take longer, but these are optional. The portable kits come with temporary anchors and include all the required items. The canvas and framing are pre-cut; also, the steel parts can be fitted easily, which helps in reducing the time required for assembling the unit. Sizes such as the 12 x 20 and 10 x 20 take only a few hours for their assembling. Also, the largest 40 inches canopy does not need more than a day for its mounting. There is no need to cut, drill, or dig. The moveable varieties of car shelters can serve multiple purposes. The basic function of these storages is to keep your vehicle protected from environmental elements, but they can also be rendered useful for storing gardening equipment, lawnmowers, bicycles, and furniture. You can also consider using the place as a workshop. These units can also be put to use during outdoor functions; they serve as shady areas. Here, we see that these kits are extremely flexible and versatile. Portable carports are mostly fixed with hardwearing polyethylene tarps, which have the ability to keep your belongings protected to a greater extent. These covers are favored because they rate high in durability. The tarps do not deteriorate easily under stressful conditions; thereby, ensuring the safety of your car and other belongings. The available sizes have a 14 x 14 denier count. 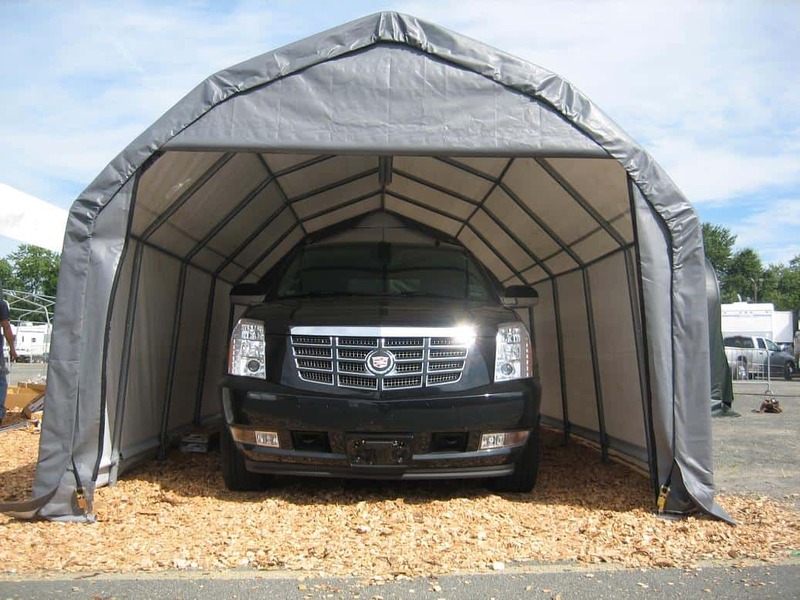 These garage covers are designed in such a manner that they are resistant to rot, UV rays, water, and mildew. Even if they are continually subjected to rough weather, they do not get damaged. These covers can endure snow, rain, and sunlight; they offer the best protection for your possessions the whole year round. Some varieties are also treated in such a manner so as to douse fires. Polyethylene covers are long-lasting; also, their replacement is easy when they old ones become worn-out. All you need to do is place an order for the same size; then, it must be attached to the frame. These covers are available in a range of sizes; you can select those that are ideal for your car. The main function of any car shelter is to keep your vehicle safeguarded from damaging elements. These could include spoilage due to harmful sun’s rays, rainfall, strong winds, hail, snow, and other harsh weather climates. Portable vehicle kits are suitable for serving these purposes. Rather than keeping your car unsheltered due to lack of garage space, it is recommended to opt for these items. They are inexpensive, hassle-free, and functional. In the above details, we have discussed the varied benefits of transferable car shelters. They are advantageous because of their nature which is inclusive of cost-effectiveness, time-saving, portability, simplicity-of-design, protective, flexibility, and easy-to-use. Furthermore, permits and permanent foundations do not constitute as the requisites for these types of equipment. An added advantage of using these spaces is that they are highly customizable. You can fill these units with cabinets and racks – whichever way you want to. Here, you can lend your individualistic touch to these rooms. You can design these units in the manner that you find suitable and feel comforted during your stay inside them.